Archangel Sandolphon's name means 'brother' in Greek; he is one of only two archangels in Heaven who have had the experience of being mortal men - the other being Archangel Metatron. 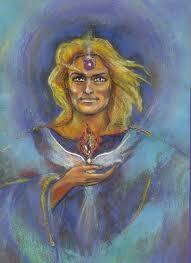 Archangel Sandolphon was the prophet Elijah, Archangel Metatron was the wise man Enoch. Archangel Sandolphon's main role is to carry our prayers up to God so they may be heard and answered. All prayers are heard and answered, although the answer may come in a different way to the one we expect or have asked for. Archangel Sandolphon's aura is a wonderful cool shade of turquoise. Try meditating on this colour, hold or wear a piece of turquoise to feel his energy drawing closer. You may feel your heart rate and breathing becoming more quiet. Shop for Turquoise.